On wedding day, it is traditional for a couple to exchange wedding rings after they say their vows. The rings are a symbol of the marriage and is the one most physically visible things to remind yourself and everyone else of your commitment, more so your status. 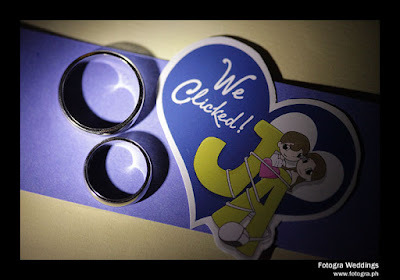 Certainly, the circle of a ring represents undying love and the continually renewed vows of the married couple. And as the newlyweds proudly wear their new rings and enjoying their new status in life, chances are neither have discussed anything else about it other than how gorgeous they may be and how happy they are to wear them. But rings, even as small as they are, come with mechanics for the couple that they should formulate and agree upon. This is more for the obsessive-compulsive. But then again, it's something to think about. I never wore a ring or any finger jewelry in my life and so I had to adjust to the fact that now, I wear a ring. But I remember having lots of trivial questions that may be petty, but since I deemed myself a newbie in wearing a ring, I had to ask my wife. Questions like, when do we take it off and when do we wear it along with several possible scenarios and variations came into play. These are some questions you may ponder on. Do you decide to wear it 24/7 ? Will you wear it anywhere and everywhere you go ? Does that include when washing your hands, taking a shower, going for a swim, handling non-hygenic items ? What to do when it causes pain ? As for us, we don't wear our rings at home. We only wear our rings when when we go out. It also gives our ring finger a rest. I guess it's also the fact that we'd be using our hands more at home like when we clean the house, wash the dishes, or other chores where the rings may pose wear and tear or much worse get lost. I personally also take the ring off whenever I wash my hands whether at home or in public. I can't seem to wash my hands thoroughly with the ring on, and I don't want the ring to get wet either, so I take it off and place it in my pocket while I wash my hands. I put it back immediately after drying my hands. So basically, my rule of thumb is that if my hands are going to get wet, I remove the ring for the time being. One problem I had with wearing the ring for the 1st month was remembering to wear it before leaving the house. It's a new habit that needs to be formed and hopefully you'll get accustomed to it no matter how busy or in a rush you may be in. One technique I formed was to place the ring in a hook in front of my keys. Since I always bring my house keys when I leave the house, it makes remembering my ring a whole lot easier since it's blocking my keys. One thing I also noticed about wearing a ring is that there are certain hand gestures that you need to modify to avoid getting injured. I'm not talking about punching someone in the face. I'm talking about applauding or shaking hands. I discovered the clapping part during one Sunday mass. When everybody applauded, I found it weird that my hands were hurting a bit while clapping. I realized it was the ring was like a sharp object poking at my skin every clap. I found out that the best and perhaps correct way to avoid this is to clap with hands perpendicular to each other as opposed to smacking your hands together in a mirror image. Another situation is when you shake hands. I'm right handed so I shake with my right hand. That didn't pose any problem since the wedding ring is on the left hand. However, for some strange reason, someone shook my left hand with a firm grip. I found my fingers squished and more importantly, the ring being pressed onto my other fingers. It felt like a construction roller compacting asphalt on a road ( ok, I dunno that actual feeling but it looks like it). I haven't found the proper way of shaking hands with a ring yet. I'm just hoping no one shakes my left hand that hard again. Also try to protect your ring from anything that may cause it to wear and tear. It's also best to keep it in a safe container when not in use. You wouldn't want to lose your ring to a stupid cat or rat mistaking your ring for yummy cereal. Remember, you are the Lord of your ring. As you vowed for a lifetime's worth of dedication to your partner, make the ring last too. When we moved the only plants in our place were 2 bougainvillas and a couple of weeds. We were so busy fixing our new home we didn't have any time to buy some plants for the tiny ledge and garden. We were surprised though by my Mom. She left 5 beautiful angel flower plants on the ledge just in time for our house blessing. Eventually she also planted some oregano in between the angel plants and they grew really fast. We've been diligently watering our plants, but had to re-pot them with my Mom's help (she volunteered because she had a bad feeling we might kill the plants!). 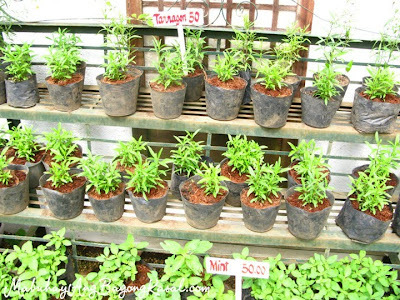 To start off your garden you can choose a couple of low-maintenance plants from a nearby gardening store. We so far have an angel plant, a couple of cactus', oregano and the 2 bougainvillas. We also got some mint and basil during our trip to Tagaytay. It would also help if you re-pot them. 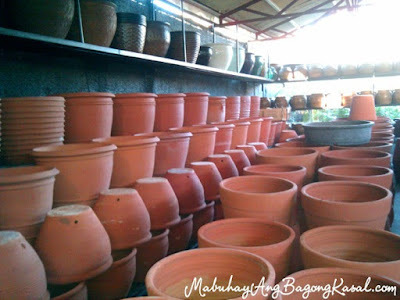 Clay pots are less expensive than plastic pots from department stores/handyman shops. 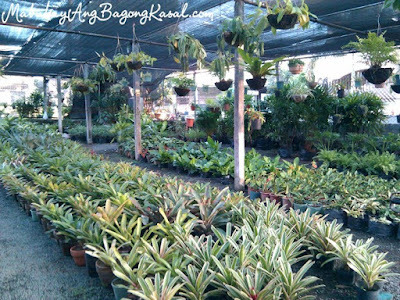 The small and medium standard pots are just about PhP10-20 each. A sack of mixed soil is PhP50. The first few weeks I was learning how to cook I asked Miguel to choose a dish he wanted me to cook. I told myself that I should just go ahead and try cooking different dishes to build confidence. My brother-in-law's comment in Facebook definitely gave me the boost I needed. He said, "You're an Apolo, I am confident that you have it in you too." So Miguel chose "Cheese Stuffed Pork Roll". We were already in the supermarket when I had him choose a recipe so we managed to get most of the ingredients right. (Pork chops aren't the best type of meat to use for this recipe). Place a slice of cheese in the middle of the pork slice. Roll it and secure with a toothpick. Dredge in flour mixture (flour and thyme). 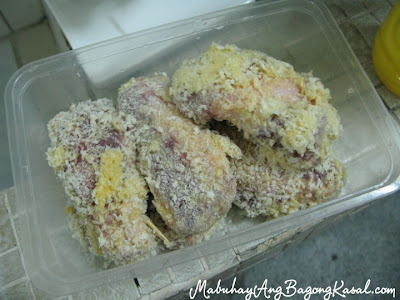 Dip in egg and then coat with bread crumbs. 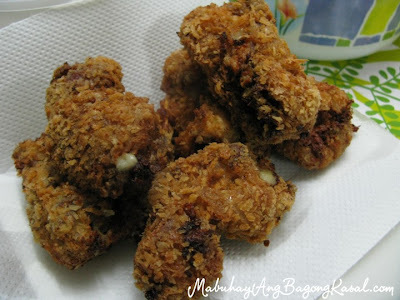 As an alternative you can also use ready made pork or chicken tonkatsu (available at SM Hypermarket), the flour mixture though is more yummy, but this is a great shortcut and will save you a lot of time. You can also add sweet ham in the roll. 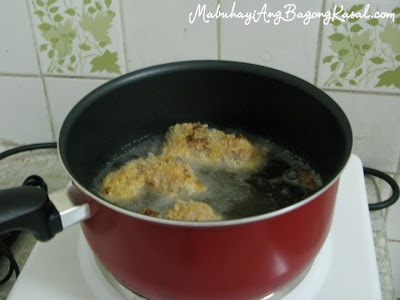 Pair this up with sinangag and a salad and you got yourself a fabulous lunch or dinner. I learned how to iron the hard way. I just did it maskipaps. Meaning, I just ironed and ironed wherever and whatever part of the shirt that fancied me. Eventually though I realized that there is a science to ironing so I researched on Youtube and found these really helpful videos. 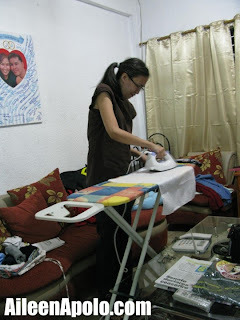 I followed the tutorial and ironing the right way decreased the time I spend on ironing. Hooray! I never thought I’d start writing about cooking but things have changed drastically in the past two months and I can proudly say that I have learned how to cook! I’m no wido when it comes to cooking since I can only get by if I have a cook book in front of me. There’s one dish though that I have learned to cook by intuition. Saute garlic in olive oil and then add the mixed peas/carrots/corn. 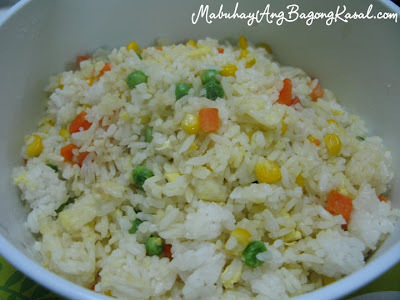 Add the rice and then mix in the Knorr Magic Sarap and egg. Saute everything together. It's so easy to make! 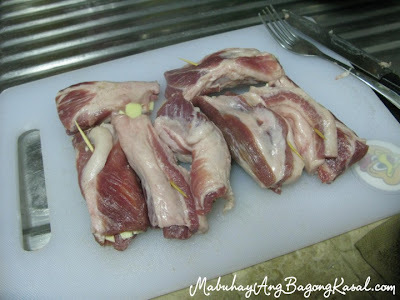 Miguel thought the sinangag I made was something I brought home as leftover from North Park! Teehee! After getting married and settling into a new home (assuming you've made the choice to live independently from any relative or family side), the newlyweds would find themselves in a totally new scenario, living together. During the boyfriend/girlfriend and engagement phase, you'd probably be together only during dates, social events, parties and out of town. Other than that, you'll go to your respective homes once the day has ended. This time it's different. Ideally, this is going to be the first time both of you would be together for practically the longest time. After all, you just vowed to each other to be together for a lifetime. And so whatever you were used to when you lived separately will have to be tested whether it would work or not. If you were accustomed to preparing the dinner table and only that, you'll have to rethink your entire habit especially if no ones gonna wash the dishes. Did you used to clean your room only once a week ? Well remember that now it's not just you living alone. So may be you'll have to clean up more frequently. 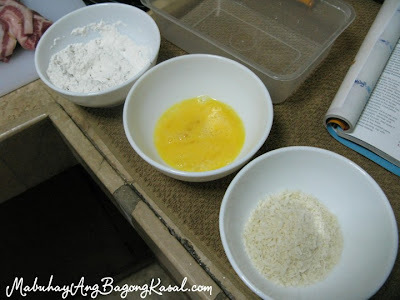 Pamamahay is the term one writer mentioned to us during a cooking demo. It's basically the couple getting a feel of their new home, new living conditions and new lifestyle and staying home to adapt to the new life together. The moving-in is the first step, with both bride and groom bringing in their own sets of stuff. The more stuff you have, the more unpacking, organizing and arranging needs to be done. From there, you have to figure out what you don't have and need for the house. You're likely to realize this as the days go by and you suddenly find out that something that was conveniently available, isn't now. In my old house, we had 5 can openers. I was used to opening cans with any of them. It slipped my mind one day when we were going to open a can of pork and beans for lunch that we didn't own any can opener at all. What we thought we had based from our separate old houses was something we needed immediately. Good thing some other cans conveniently have a built-in latch for an easy pull-to-open mechanism. Is it best to throw out the garbage every night or wait for it to be filled ? Do you keep the frontyard lights on or off during the night ? Do you hang your clothes or fold them ? Would you both like to have a pet or not ? Which brand of soap or detergent would both of you agree on using ? As the weeks go by, things will just fall into place. You would have decided which works best for you. Both of you will get a hang of things and will do things more efficiently, may it be as big a task as doing the laundry and cleaning the house or as simple as slicing an onion and fixing your bed. 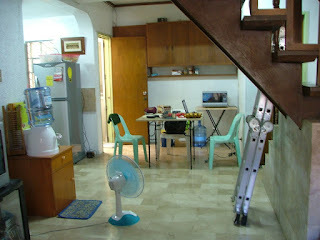 Whether you discuss your roles in maintaining your household or just simply do what you do best and help out in the other chores, this will be mastered within months and soon enough, what seemed be impossible and take forever to accomplish may be a like breeze in the park after your pamamahay stage.